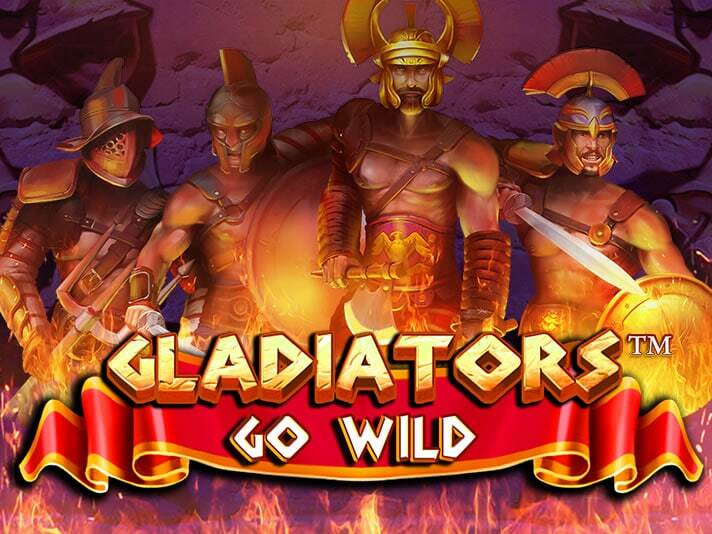 Join the tough guys of the ancient world in Gladiators Go Wild. This trip back to Rome has been created by iSoftBet and is played using an unusual 6 reel, 10 payline game engine. Stacks of gladiator symbols turn wild and lock in position for the spin that follows. Play on your PC, tablet or mobile from between 10p and £10 per spin. The set up in Gladiators Go Wild is very straightforward. Set against a flaming backdrop the deep purple reels are made up of lower value A to 10 symbols as well as a quartet of higher paying gladiators. The best of the fearsome foursome is the bearded fighter with the gold helmet. Land 3, 4, 5 or 6 of him and you’ll receive a payout of 2, 10, 20 or 40 times your stake. This is a win both ways game so winning combinations can start from both reel 1 and reel 6. What you’ll really be hoping to see here are stacks of the same gladiator. This turns into a stacked wild and locks in position for the spin that follows. This is known as the Gladiator Wilds feature. If you land another stacked wild on that spin, it too turns wild. The original stacked wild remains locked in position too. Multiple stacks of wilds can lead to some potentially spectacular winning combinations. Gladiators Go Wild is a simple game in both design and features. The visuals are neat and crisp enough though and though the range of extras isn’t large there’s enough action from the stacked wilds gladiators to keep things interesting. That’s definitely the case if you manage to find multiple wilds on the same spin. We’ve taken plenty of virtual trips to the land of the ancients. We haven’t seen many like Gladiators Go Wild though. The comic-book style design and straightforward gameplay come together surprisingly well. The stirring orchestral score wouldn’t be out of place in a Hollywood blockbuster either. Medium variance, you can win 800 times your stake if you manage to fill all 6 reels with wilds. Now, the stacked wilds remain on the reels for the next spin so you could technically win 1,600 times your stake from both spins. Put all that together and Gladiators Go Wild becomes a very playable game. Yes, it’s rather basic, but the stacked Gladiators could lead to some epic results. If you like the gladiator theme, Yggdrasil Gaming’s Champions of Rome and Quickspin’s Tiger’s Glory would be my recommendations.